Until this past September, I had never been to Paris, and a fortiori, had never been to the Musée de Cluny (Musée Nationale du Moyen Âge), or the medieval collection at the Louvre, or the treasury of the Cathedral of Notre Dame. My son and I visited these three remarkable places, looking closely at the liturgical treasures they contain. Although we told ourselves ahead of time that we were going to favor our eyes and brains and not take pictures of everything, I allowed myself photos of items that struck me as having, for one reason or another, high interest to NLM readers. In the past, NLM has drawn attention to custom-made altar cards for the traditional Latin Mass and has recommended that people commission altar cards from artists or, at very least, search around for more artistic diversity than the standard cards that are reproduced in vast numbers, as useful as they are unquestionably are. When one is just starting up a TLM apostolate, the budget is usually tight and what matters is having an affordable set of altar cards available for Mass. 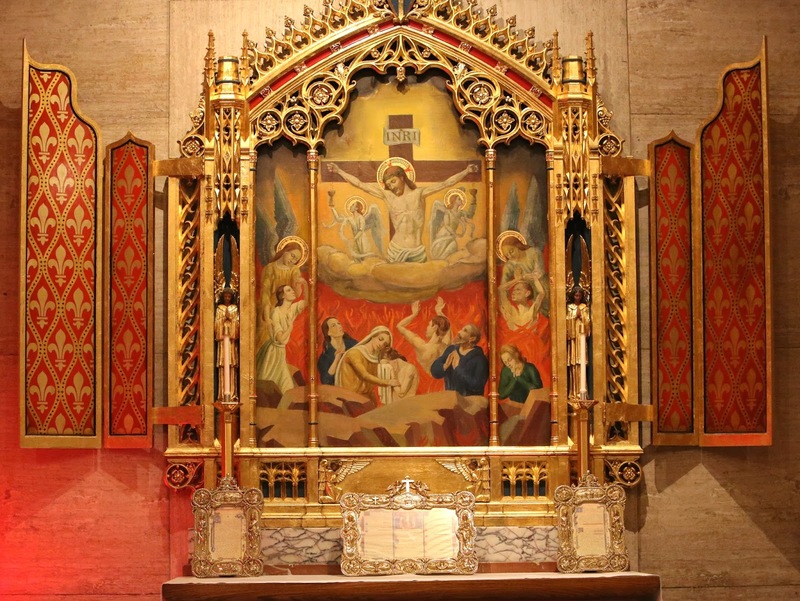 As time goes on, however, and especially in the context of a stable community, a dedicated parish or a religious house, we may want to give serious thought to how we might augment the beauty of the furnishings of the altar and the sanctuary, and even, if possible, use the occasion for offering patronage to a promising Catholic artist. The fine arts will never take off again in the Church if we who claim to love beautiful things do not step forward and donate for this specific purpose. It is no insult if a patron asks an artist to emulate an historical model, and no shame if an artist produces excellent copies of past models. So much great art of the past, particularly in the Middle Ages, was born in the midst of a well-defined system of apprenticeship, with successive artists able to achieve better work thanks to the humble discipline of faithful imitation. The modern cult of the artistic genius and his or her “originality” has led only to an accelerating debasement and derangement of art. If today’s artists start off by patiently and humbly emulating historic models, tomorrow’s artists, under the guidance, might stand a chance of producing something more brilliant and unique, while yet beautiful. Today, I would simply like to share photos of a set of altar cards kept in the treasury of the Cathedral of Notre Dame. Their exquisite calligraphy and ornamentation, set within the Baroque frames, elevates them above the realm of the everyday or the utilitarian. These are no longer mere textual prompts but works of beauty that give glory to God, the Greatest and Best. 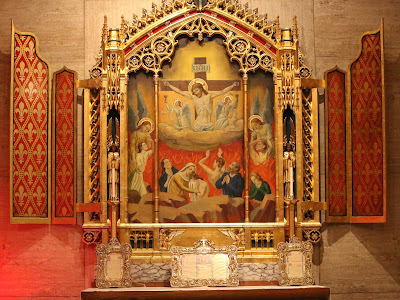 While I’m at it, let me share a photo of a side altar at St. Catherine of Siena church in New York City, an altar dedicated quite obviously to the celebration of Masses for the Holy Souls in Purgatory. Notice how the altar cards here are exceptionally well integrated into the overall scheme, and how they make their own artistic contribution to the ensemble. It is as if the craftsman said to himself: “These cards have a certain function, but since they are going to be visible throughout, I will make them worth looking at.” It is one more example of the Catholic way of raising up the mundane and making a virtue of necessity.